Thought I'd share an interesting find. I don't own many original production backgrounds. My animation art collection is primarily Disney cels. But this week I acquired an original hand-painted master background from Filmation's JOURNEY BACK TO OZ. And of course my first thought was to share it with you. I have scanned it, so what you are seeing here is not a digital recreation, but a scan of the actual artwork! Below, I have included a screen grab of this background in a single frame of the film. Interesting to see how various video production monkeys get their hands on films and ruin the integrity of the color palettes. I have seen this time and time again. 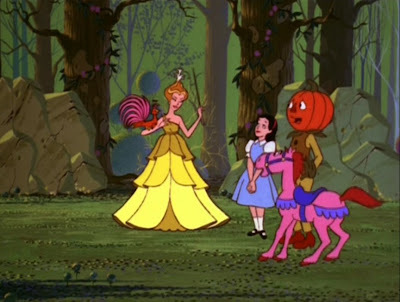 Perhaps the most distressing is early animated classics with the color intensities so ramped up they look like a different film. who thinks this is really necessary to sell DVDs? While not an animation classic, this production took nearly a decade for Filmation to complete. 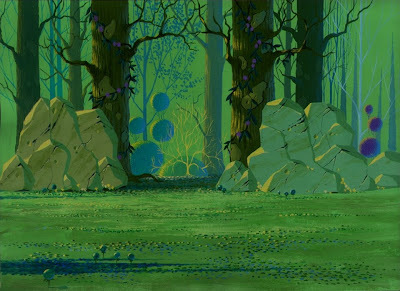 This particular B/G definitely has a kinship to Eyvind Earle's work... even if it is a distant cousin.